Voters do not see the necessity of a college education as strongly as they did four years ago, and they are open to a range of potentially major changes in public education, according to the University of Texas/Texas Tribune Poll. 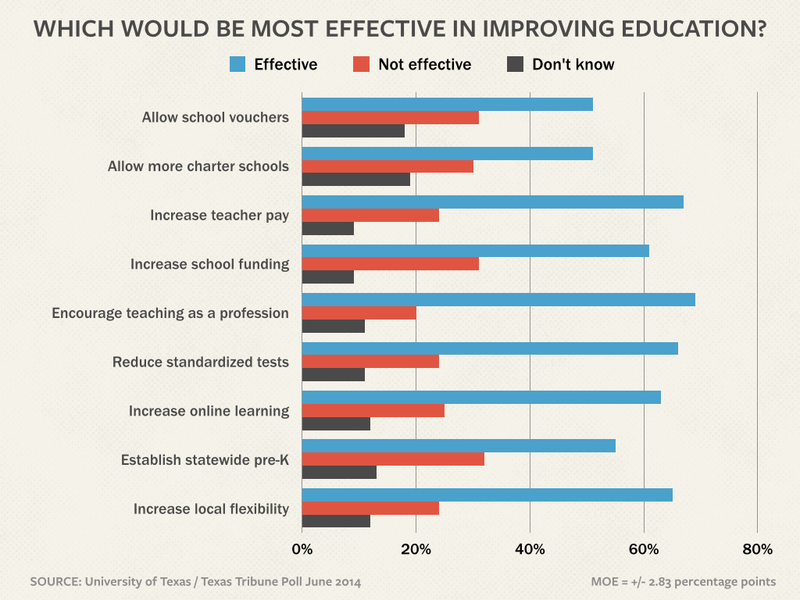 Texas voters are supportive of some potentially major changes in public education, from providing incentives to people who want to be teachers to allowing more local control over standards and curriculum, according to the University of Texas/Texas Tribune Poll. Meanwhile, fewer of them are convinced that a college degree is a necessity. 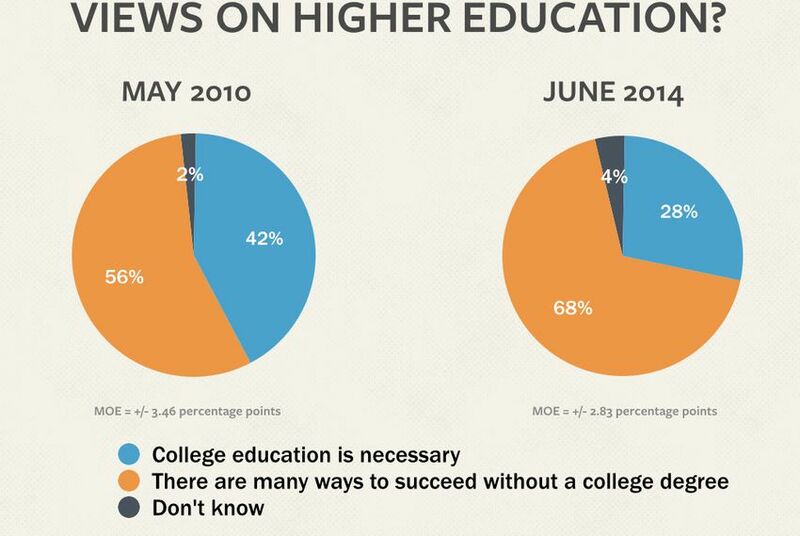 Only 28 percent said a college education is necessary for a person to succeed in today’s work world, while 68 percent said “there are many ways to succeed ... without a college degree.” That’s a big change from the UT/TT Poll of May 2010, when 42 percent called college necessary and 56 percent said there are other paths to success. Jim Henson, co-director of the poll and head of the Texas Politics Project at UT-Austin, said the movement in the numbers from 2010 to now is significant. Voters are open to an array of proposed education reforms, including school voucher programs, more charter schools, higher pay for teachers, increased funding for public education, encouraging new teachers to enter the profession, cutting standardized tests, more online learning, statewide pre-kindergarten and greater local control over schools. But not all reforms are created equal. While 69 percent said incentives to choose teaching as a career would be “extremely” or “somewhat” effective, only 51 percent gave those marks to voucher and expanded charter programs. Higher pay for teachers was attractive to 67 percent, and reducing the number of standardized tests was judged effective by 66 percent. At least 30 percent of the poll respondents judged four ideas to be either “not very” or “not at all” effective: statewide pre-K, school vouchers, increased school funding and expanding the number of charter schools. 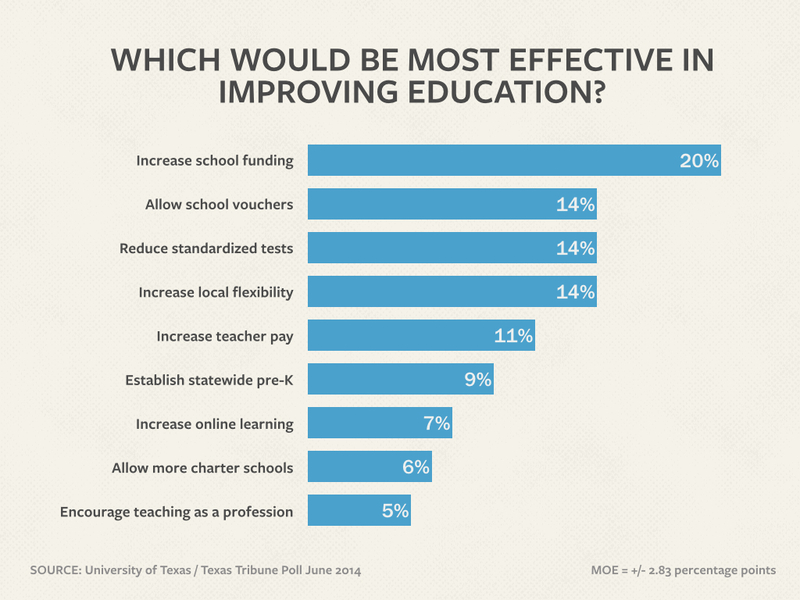 Asked to choose a single reform from the list that would be most effective, 20 percent chose increased funding for education, while three selections each got 14 percent support: creating a school voucher program, reducing tests and allowing more local control. The selections have a partisan tang to them. Voters who identify themselves as Republicans chose increased funding, more local control and vouchers as their top three choices. For Democrats, the top three were increased funding, reduced testing and statewide pre-K. And those who identify themselves as Tea Party voters chose vouchers, local control and more charter schools. This is one of several stories on the latest University of Texas/Texas Tribune Poll. Thursday: The statewide general election races and a peek at the 2016 presidential primaries. Friday: Texans’ views on various officeholders and candidates, on the state of the state and the country, and on the Tea Party. Yesterday: Which major party candidates for governor would do a better job on big issues, and most important problems facing the state and the country. Tomorrow: Voters’ views on immigration and the Affordable Care Act. Texas voters on a range of social issues.